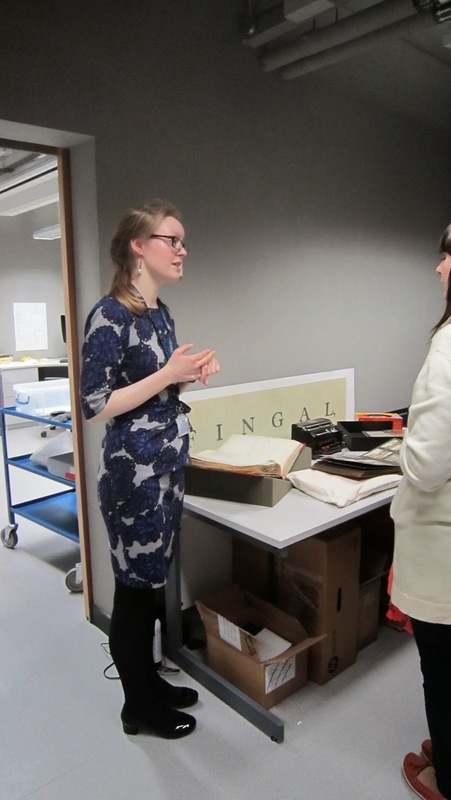 This week, staff from across the archives in the Centre for Research Collections got together to discuss the upcoming centenary of the First World War. We discovered traces of the war in collections across the University, from the memories of animal geneticist Professor Francis Crew held by the Towards Dolly project to the experiences of students preserved in the Edinburgh College of Art archives. As we thought about items in our own collections, I remembered my first experiences at LHSA in 2009, when I came as a volunteer to catalogue the papers of Amelia Nyasa Laws (1899-1977), an osteopath who spent the last years of her life practising in Edinburgh and whose father, Dr Robert Laws (1851-1934), was the leader of the Free Church of Scotland’s Livingstonia mission in Nyasaland (now Malawi). Amelia was born in on lake Nyasa and from then on led a varied and well-travelled existence, and in 1916 became a masseuse in a French field hospital. You can see a picture of her here. On account of the centenary events, we have been receiving quite a number of enquiries based on Edinburgh’s experiences of the First World War. Some of these queries are centred on the 2nd Scottish General Hospital, Craigleith, a former poorhouse adapted for use in wartime as a hospital. 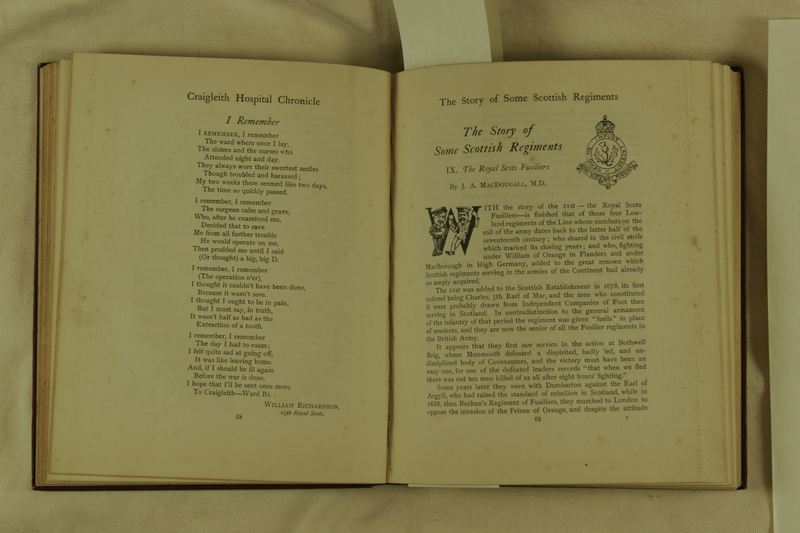 Although we have relatively few records on the institution in this period, those that we do hold are fascinating, including editions of the hospital magazine, the Craigleith Chronicle. There is one edition of the Chronicle available on our website, here. Other enquiries we have been receiving centre on Edenhall Hostel for Limbless Sailors and Soldiers, an institution originally founded in 1915 in Kelso in order to care for soldiers who had lost limbs in combat and to teach them how to use the artificial limbs that were made for them. On account of a shortage of beds at Kelso, the institution was moved to Pinkieburn, Musselburgh, in 1917. However, apart from a few photographs of interiors, we have relatively few original records from the early years of the Hostel at Pinkieburn, and we have been speaking to colleagues at Musselburgh Museum to help fill some of the gaps in our knowledge. So if you can also help to tell us more about the early history of the institution (or even have some early records or photographs), do let us know! To jog your memory, Su Leslie has written a fascinating blog post on her own family connection with Edenhall here. This week’s blog sheds some light on pioneering Edinburgh surgeon Professor Sir Harold Jalland Stiles, 1863-1946. One of the third generation of East Lincolnshire doctors, Harold was told by his father that his older brother would succeed him into the family practice, therefore if he too wanted to be a doctor he would have to seek his own career. Successfully passing his preliminary exams, Stiles moved to Edinburgh in 1880, having become heir to dissecting arm, leg, head and neck specimens from his grandfather! Graduating in 1885 with first class honours as the most distinguished student of his year, Stiles became the Edinburgh University assistant to Professor John Chiene for the next nine years. Stiles was appointed surgeon to the Royal Edinburgh Hospital for Sick Children from 1898-19 and also assistant surgeon at the Royal Infirmary of Edinburgh. A disciple of Joseph Lister’s school of medicine in regard to antiseptics, Stiles is believed to be the first to introduce aseptic surgery to Edinburgh. Important areas of Stiles’ work included pathology, anatomy, studies into breast cancer, hydrocephalus and tuberculosis, a main source which he concluded was the bovine tubercle bacillus. Therefore, to control the spread of tuberculosis he advocated regulating milk supplies. Stiles is also now recorded as being the first to carry out a pyloromyotomy operation as treatment for the congenital condition, pyloric stenosis in 1910, although the name of this operation was given to another surgeon, Rammstedt. During the First World War, Stiles organised the orthopaedic department of Bangour Hospital, where he also branched out into studies of the peripheral nerves. He was knighted for his services in 1918. He was appointed to the Chair of Clinical Surgery at the Royal Infirmary in 1919 and became surgeon to King George V in Scotland for the period 1923-1925. He retired, quite abruptly to his home in Gullane in 1925 where he studied natural sciences, including geology and the flora and fauna of East Lothian until his death in 1946. P\PLI\NI\030 Professor Stiles in about 1920. Today has been the first time we have offered events in the Edinburgh International Science Festival. As well as a couple of talks, we welcomed members of the public and University colleagues to the Centre for Research Collections to see behind the scenes in our conservation studio, Digital Imaging Unit and stores, with each space dedicated to a science-related collection, all of which have received Wellcome Trust funding for essential cataloguing and conservation. Emily, our Project Conservator, described her work on the HIV/AIDS collections, particularly the challenges of treating modern materials, and demonstrated her clever storage solutions for those awkwardly shaped collection items! 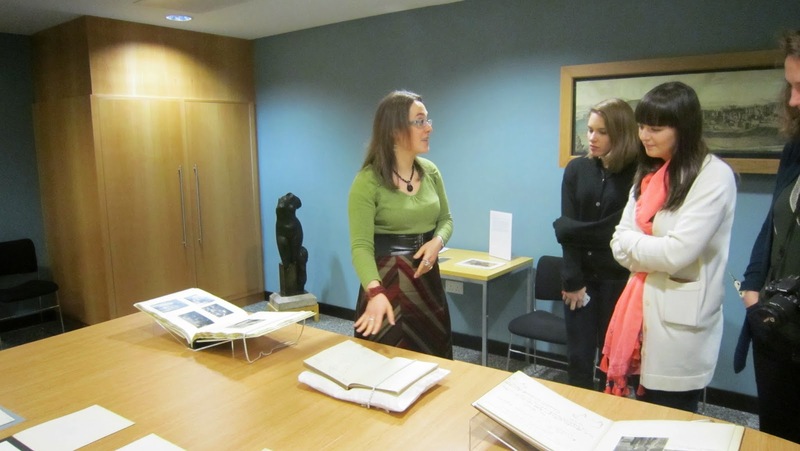 To find out more please see past posts on our blog at http://www.lhsa.blogspot.co.uk/ and her new project webpages at http://www.lhsa.lib.ed.ac.uk/projects/UNESCOcollections.htm. 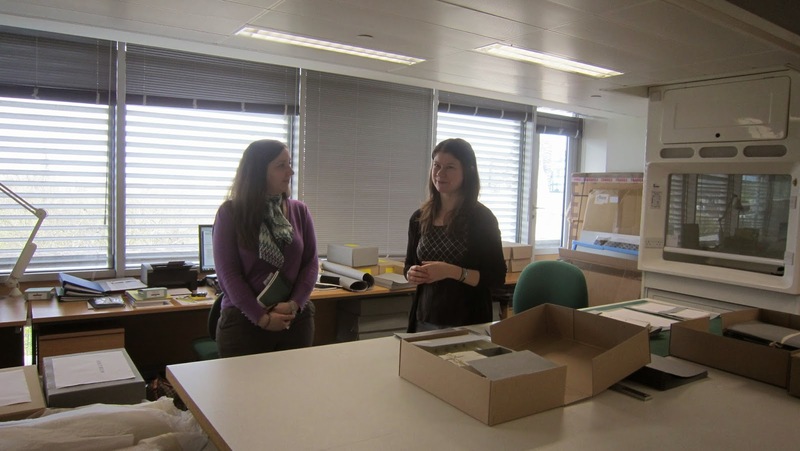 Clare (Project Archivist), who is cataloguing papers relating to animal genetics, and Louise (LHSA Archivist, and former Project Archivist cataloguing neurosurgical case notes) showed our visitors into two spaces within the Centre for Research Collections - our viewing room and one of our stores - as well as key items in the collections. If this has whetted your appetite, we are running the tour again tomorrow (Saturday 12 April) morning. Tours are free but ticketed so if you’d like to book a place, please keyword search ‘behind the scenes’ on the Science Festival home page: http://www.sciencefestival.co.uk/. 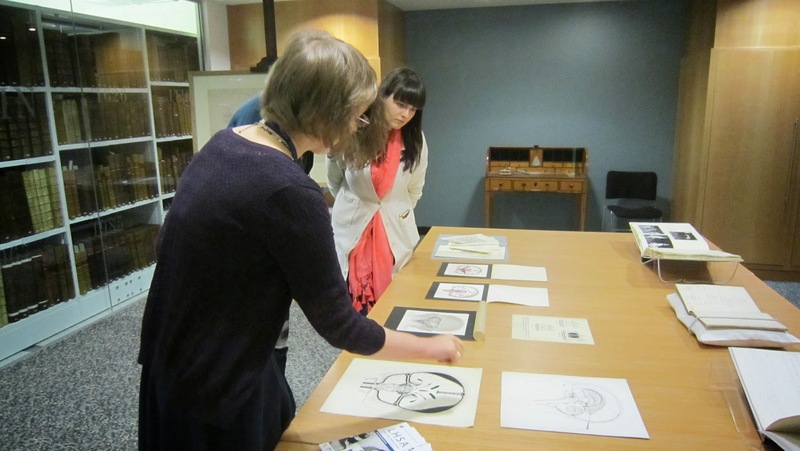 In this week’s blog, our project conservator Emily looks at the processes and materials used to create modern papers. 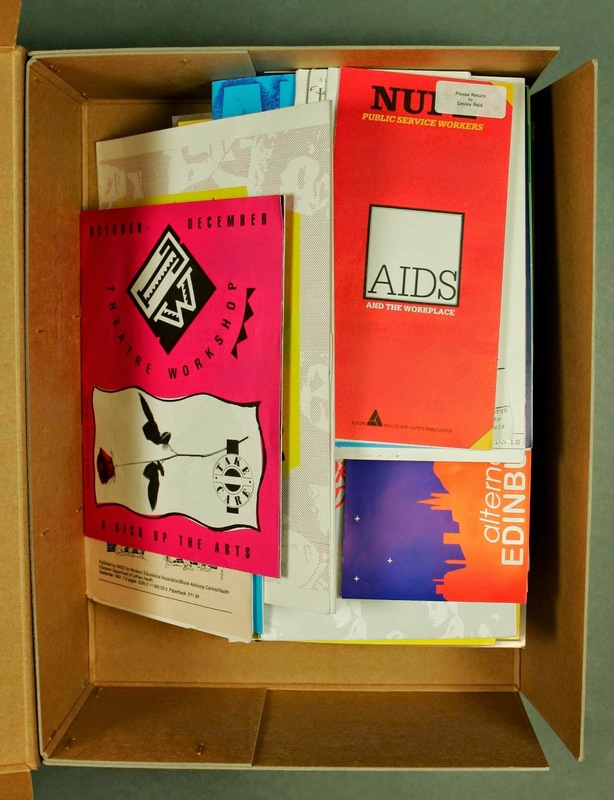 I have recently started working with one part of the HIV/AIDS collection that is mainly made up of loose paper documents from the late 80s and early 90s. There is a huge diversity of papers found in the collection, from glossy papers used for flyers to regular office notepad paper, folders made from thick card to faxes made from shiny lightweight paper. As a conservator, I wanted to find out more about how papers formed in the past 50 years are made and how they might deteriorate in the future. A selection of papers found in GD22, before treatment. Modern papers are mostly made from wood chips. This material was first used as a source for paper in the 1840s and was ground mechanically to create the fibres. However, this method does not remove the lignin which is found in wood chips. Lignin is a complex organic polymer that binds to the cellulose in wood to strengthen and harden it. Papers with a lignin content are prone to acidity, likely to become brittle and can darken on exposure to light. Most newspapers are formed from this type of paper and the image below shows a newspaper from the HIV/AIDS collection that has discoloured overtime. Traditionally, paper was created from linen rags which do not contain lignin, which explains why paper made in the past 100 years often show more signs of deterioration than papers made 500 years ago. A newspaper from GD22/10. The paper has become brittle and the edges have discoloured. Papers made from the late 1970s onwards are mostly formed from wood chips that have been softened using steam and pulped mechanically in a process called thermomechanical pulping. Since the chips are firstly softened, less energy is required than the previous solely mechanical method and less damage to the fibres is caused, resulting in a stronger sheet. This method also allows for chemicals to be added to the pulp to improve the sheet. For example, calcium carbonate can be added as a filler. This acts as an alkaline buffer against the formation of damaging acids within the sheet. This method improved the quality of the sheet, but still does not remove the lignin. Today, most paper is created using the sulphate process. This was first used in the 1930s and involves treating the wood pulp with a mixture of sodium hydroxide and sodium sulphide to extract the lignin. This method produces a strong, less acidic sheet. Paper made with this process will age better than previous modern papers. The characteristics of paper can also be changed using additives. For example, bleaches and optical brighteners can be used to lighten the paper and colourants or dyes are used to change the paper colour. Different finishing processes and coatings can also be used to change the surface texture of the sheet. For example, paper sheets can be glazed to make them super glossy for use in magazines or left uncoated to be used as stationary. A collection of differently coloured office papers found in GD24. The use of new materials and new manufacturing processes has increased the types of paper available in the past 50 years. However, these processes and materials effect of the longevity of the sheet and how it will respond to treatment. As such, the conservator must be aware of the methods and materials used to form modern papers in order to successfully treat them.